8 Pin Male to Female Extension Cable Cord for iPhone / iPad Air / iPad Mini / iPad Pro / iPods Full functionality extender cable for new iPhone / iPad air, iPad Pro, iPad Mini / iHome [AP003406] - $7.95 : allputer.com - Accessories for all your Portable Electronics & Computers! - The Extender Cable allows you to dock your iDevices from a distance, provides connection pathways for power audio output USB data sync play controls accessory power and composite video. It does not support S-video output or input for recording audio. - You can use it to charge your iPhone / iPad Air / iPad mini / iPod Touch / iPod Nano, listen to music, watch movie and transfer data, sync via other function cable. 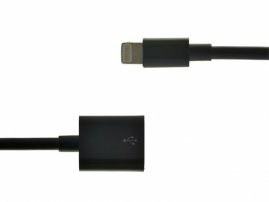 - You can connect your Apple devices with the Lightning cable to do these things (see below) by this extension cable. - You can use it to charge your iPhone / iPad Air / iPod Mini / iPod Touch / iPod Nano, listen to music, watch movie and transfer data, sync via other function cable. - You can use it to charge your iPhone / iPad / iPod / iPod, listen to music, watch movie and transfer data, sync via other function cable. - All cords inside, include audio, video, sync, charger pin. - If you plug the extension cable into the iPhone first (male end of cable into iPhone, female end not connected), it will be detected as an OEM cable and come to a message and that it may not work. If you plug it into the device first (connect the female end first), and then plug the male end into the iPhone, it will work as desired and will not prompt you a message. However, if there is really such message, just cancel it. - For using your new iDevices with old devices for older iDevice. - For testing, if you are developing a product for iPhone / iPod, you may need to test your product with iPhone / iPod for thousand times, then this cable may help becase it eliminate the direct damage to your iPhone / iPod. - If you have some devices that is capable (compatible with) of your iPad / iPhone / iPod, just that the physical space is too small for your new iPad / iPhone / iPod. - Not recommended to use this cable for charging, as it will take it longer comparing to the situation without this cable. - This is an OEM product, not original product from Apple Inc..